I love Astin Trew. I reviewed the At3500 CD player last year and liked it so much that I bought it. It has been my reference CD player since, and has already beaten quite a bit of competition, without too much effort. It sounds wonderfully warm, resolved and natural and is very easy to live with. Astin Trew make more things than CD players though, so I was quite eager to find out about their amplifiers. Michael Osborn, 'Mister Astin Trew', kindly offered the At2000plus for review and I was more than happy to accept. 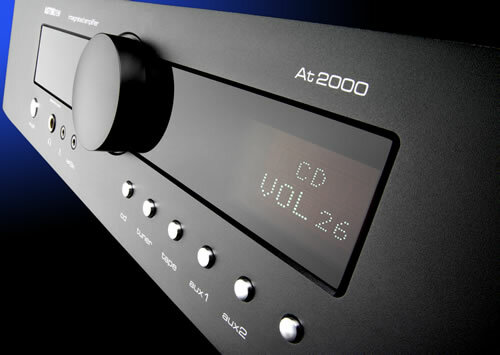 The At2000 is an integrated amp with a solid state preamp section, biased into class A, and the output stage of the At5000 power amp. The 'plus' suffix indicates this is an improved version, which should be even better. The At2000 uses the patented 'never connected' power supplies for all low power circuits which should make it very quiet. The output stage is a hybrid design, using both valve and transistor devices. Output power is a good 65 watt into 8 ohms and a slightly higher 85 watt into 4 ohm. The amp can be split into a separate pre and power amp, with the power amp input selectable as just another input, enabling a switch between integrated and separate use at the push of a button. You could, in theory, even connect a CD player with variable output to the 'power in' directly and all your other sources to the normal inputs and just switch between all of them. Clever stuff. The 'plus' version features better coupling capacitors and better internal wiring. This should give it greater transparency and more focus. I never heard a 'non-plus' At2000, so I cannot comment on the value of the 'plus' upgrade. The value of the At2000plus on its own is undoubtedly high, with all its features, its excellent build quality and good looks. There's also a 'plus' version of the At3500 CD player available, by the way. Needless to say I just had to try that too, but that's another story. There are 4 RCA single-ended inputs, two XLR balanced inputs and an RCA subwoofer output. There are also ethernet input and output sockets, allowing multi room application, where music and control data can be sent around the house. And there's even an RS232 serial bus connector. At the front there's a normal and a mini-jack headphone output and a mini-jack ‘MP3' input. There are no tone or balance controls, and neither is there a phono stage included, but those must be the only things this amp cannot do. It certainly is the most versatile bit of kit I've ever had in my system. In spite of all these fancy features, the amp is as easy to use as any integrated I've had. The case work is identical to the At35000 CD player and is shared by all Astin Trew products. It looks good and is solid and practical. There's a choice of silver and black. The remote is a bit basic but worked well, except for the fact that it wouldn't control my At3500 CD player. It should be able to, but Michael Osborn told me the control software will have to be updated for this to work. The latest versions of the Astin Trew CD players won't have this problem. I had to put my beloved Django transformer preamp to the side to use this integrated amp. The At2000plus does have a preamp output and a power amp input, so it can be used with a separate preamp, but I thought it was better to first try it on its own. This is how it will be used by most people, after all. The amp took a few days to reach its maximal performance and sounded very refined and confident after that. The sound is smooth and musical without anything standing out or falling short. The overall presentation seemed very natural and even handed. Sometimes a component is so balanced and transparent that it runs the risk of not being noticed. The At2000plus is almost such a component. Almost, because it indeed does have a remarkable ability to step aside and let the music speak for itself, but it also has such refinement and coherence that I couldn't help noticing it. It is always there, in the background, working its magic, but never drawing any real attention to itself. I used it with two different CD players and my venerable Micro Seiki turntable as sources, and I drove 4 different speakers with it and it never had a problem with any of them. Always well behaved, always doing the right thing, always sounding great. In short, a wonderful amp. There's actually a little bit more to it than just doing a good job, or disappearing elegantly. It has enough weight, without being slow or heavy. It is airy, agile and precise, without being overly bright or analytic. It will drive most speakers and go loud enough, but still excels at low-level, late night listening. In short, it is a ‘have your cake and eat it' amp, at least at this price. The only slight criticism would be that it sounds a little bit soft. I'm not saying it is dull, or blunted, as it isn't, but it certainly is a tiny bit 'over-polite' compared to my own Electrocompaniet amp, and most other amps I have used, even if it beat those other amps in most other respects. And I also have to add that this really is the only criticism I have of this amp. Of course, it's all relative and depending on system context, but I was at least using it with its natural partner, the Astin Trew At3500 CD player, so that wasn't the problem. My own loudspeakers, Dynaudio Contour 1.8 mk2, are a little bit soft themselves, but I also used it with the excellent Aurousal VS speakers, which are very crisp and transparent, and it was still slightly soft with those. To investigate further I reinserted my Django transformer preamp in the system. This is incredibly easy with the At2000plus thanks to its selectable power amp input. Using the Django instead of the integrated preamp makes a clear difference. I would have been worried if it hadn't because the Django is almost as expensive as the At2000plus. It is not really fair to compare a simple preamp section of an integrated with the great preamp that the Django is, but it does show how capable the power amp section is. The sound opened up considerably, with a more lively presentation and a sound stage that was almost a meter bigger in all directions. The softness of the At2000plus was completely gone and replaced with a smooth, finely textured and very natural acoustic space. In photographic terms, it was as if the colours were a bit more saturated and the contrast had been turned up a notch. Used in this way the At2000plus was able to create real magic in my system, making my good old Dynaudios sound as brilliant as they've ever sounded. It's as much a case of correctly reproducing what is in the recording as well as not adding anything to it. This combination was able to reproduce things faithfully in a clean and convincing manner, making it sound as real music and not just as an electronic reproduction. It makes you focus on the musical event, almost forgetting the system that's doing all the work. Used in this way it was one of the best power amps I've had in my system. When I took out the Django again and went back to the At2000plus on its own I was prepared for a big disappointment. But I needn't have worried. This is a really good amp, and even if it sounds better with the Django, it still sounds great in integrated mode too. The softness is there again, indeed, but the smoothness, the refined tonality, the even-handedness and the clarity are still there too. I was able to really enjoy it, even with the memory of the pre-power setup still in my ears. Many modern loudspeakers sound more forward than either my speakers or the Aurousals, and the At2000plus would be an excellent partner for those. Actually, for many smaller budget speakers this amp will be a blessing, except that you shouldn't be using a fine amp like this with harsh budget speakers, of course. This is a wonderful amp, very versatile and easy to use with many practical features. The sound is smooth and refined, if a little bit soft. It has a very musical personality, with natural sound and great transparency. For the money this is a fantastic amp, very much in the tradition of the venerable At3500 CD player. Very highly recommended. We set out to design an integrated amplifier that would suit both two channel 'audiophiles', and regular music lovers, who want their A/V and/or multi-room audio to sound excellent; and fitting with our philosophy of selling products that offer musical insight (entertainment), that is usually only offered by far more expensive products. We did not want to fall into the trap of designing a flexible product, suiting a wide customer base, but failing to offer excellent two channel amplification for dedicated two channel (or 2.1 set ups) - as this is our main market and focus for all our products. Many loudspeaker designs in the price range one would normally think of when partnering our AT2000 amplifier tend to have slightly forward presentation, and/or an 'explicit' or dry upper mid-range and top end, and this can be tiring to listen for protracted periods, whilst very impressive in the dealer demonstration room! Our AT2000 class A biased pre-amplifier and famously musical power amplifier design are the perfect integrated partners in our view, with most mid-price loudspeakers, to offer a very natural open sound that draws you into the music and holds you there. Michael Osborn M.D.